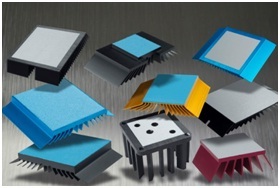 Dow Corning has introduced the new Dispensable Thermal Pads, a new technology developed for more cost-effective thermal management of high performance electronics targeting LED lamp and luminaires, data servers, telecommunications equipment and transportation applications. According to the silicon-based technology supplier, this new materials enable manufacturers to quickly and precisely print a layer of thermally conductive curable silicone compound in controllable thicknesses on complex substrates while ensuring good thermal management properties and reduced manufacturing cost. As said, the new technology reduces material costs by 30-60% by eliminating waste more common to conventional fabricated thermal pads. It also enhances thermal performance and accelerates manufacturing cycles. The materials can be applied via standard screen or stencil print processes, or by using standard dispensing equipment, noted Dow Corning. Either way, Dispensable Thermal Pads easily conform to complex and unevenly shaped substrates and cure in place to help increase throughput and provide greater flexibility over deposited layer thickness. Dow Corning’s new line encompasses four products, distinguished by varying levels of thermal conductivity with or without controlled bond line thicknesses. Dow Corning TC-4015 and Dow Corning TC-4016 Dispensable Thermal Pads offer thermal conductivity of 1.5W/mK, and Dow Corning TC-4025 and Dow Corning TC-4026 Dispensable Thermal Pads offer higher 2.5W/mK thermal conductivity. Two grades, Dow Corning TC-4016 and Dow Corning TC-4026 Dispensable Thermal Pads, incorporate glass beads to offer improved control over bond line thickness. All products in the company’s new line bond well with common electronics substrates like aluminum and printed circuit boards, emphasized the company. In addition, because the materials eliminate the fiber glass carrier used for conventional fabricated pads, they offer lower thermal resistance, good compression and reliable, high quality thermal management over the lifetime of a product.